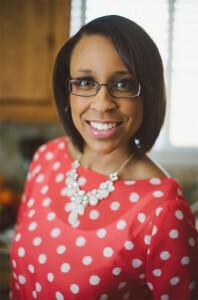 Hi, it’s Yvonne from Tried and Tasty and I’m so excited to bring you a fresh new recipe! The second the weather warms up enough to fire up the grill, you’ll find me and my husband outside with our burgers and chicken almost every night. There’s just something about the warm air, an occasional cool breeze, the sound of the neighbor kids and the smell of the grill going. Is there anything better? I fired up the grill for the first time around the end of April and haven’t looked back since. Have you ever been to Rumbi Island Grill? It was the inspiration behind this recipe. I love their Jerk Chicken Sandwich. It is SO delicious. I figured I’d take a crack at making something similar at home. Paired that with the idea to scale things down and this ‘slider’ was created. The great thing about sliders is they are perfectly proportioned for kids and adults alike. You can have one of them, or you can have a couple of them. 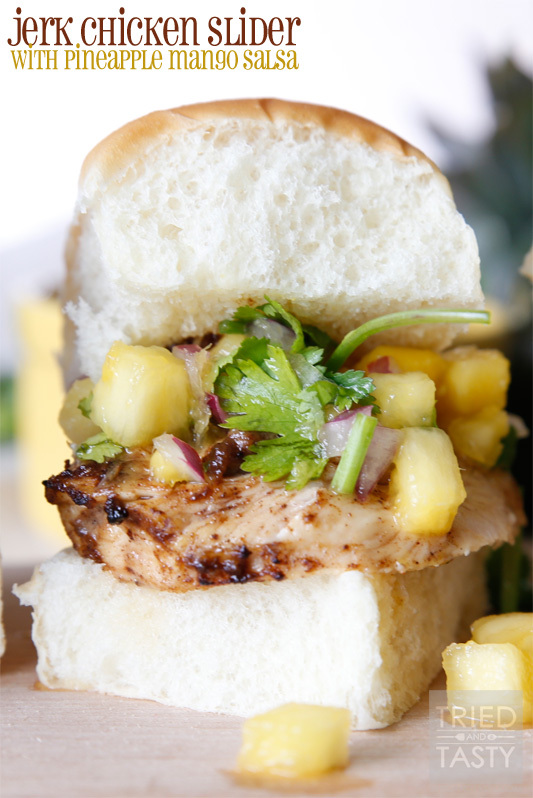 I first marinated my chicken, threw it on the grill, whipped up a quick pineapple salsa and shortly thereafter enjoyed a pretty fresh faand fantastic meal. 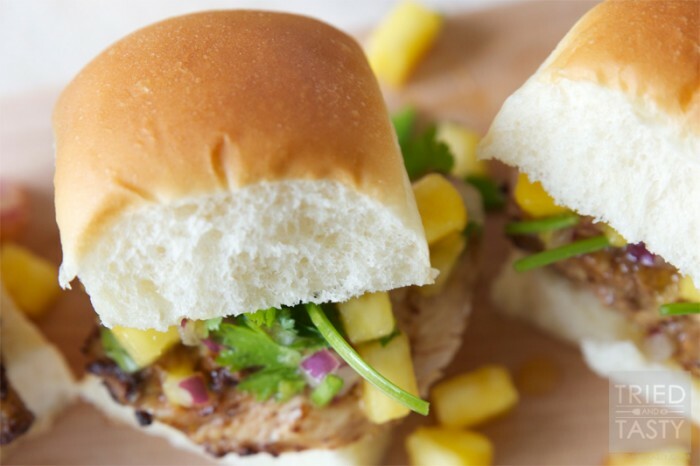 This absolutely screams summer to me, so if you’re like me and you are itching to fire up the grill but don’t want the same ‘ole boring burgers and chicken: give this a try! For other great grilling ideas, check out a few of my other grilled favorites: the Cinco de Mayo Queso Blanco Burger, Mouth Watering Tasty Reuben Burger and Bacon Guacamole Burger! All are delicious choices to add to your rotation! These are so simple to make, full of flavor and a recipe the whole family will enjoy! Combine pineapple, Mango, red onion and cilantro. Squeeze in lime and spindle with salt. Stir to combine. Marinate 2 large chicken breasts in ¾ of the jerk sauce (reserve ¼ of sauce for basting) for at least 30 minutes up to overnight. Once marinated, cut each chicken breast in half and place on a preheated grill. Grill 7-10 minutes (depending on the thickness of your meat) until temp reaches 165 degrees F. Baste chicken with remaining jerk sauce. Remove from grill. Cut each chicken breast in half. 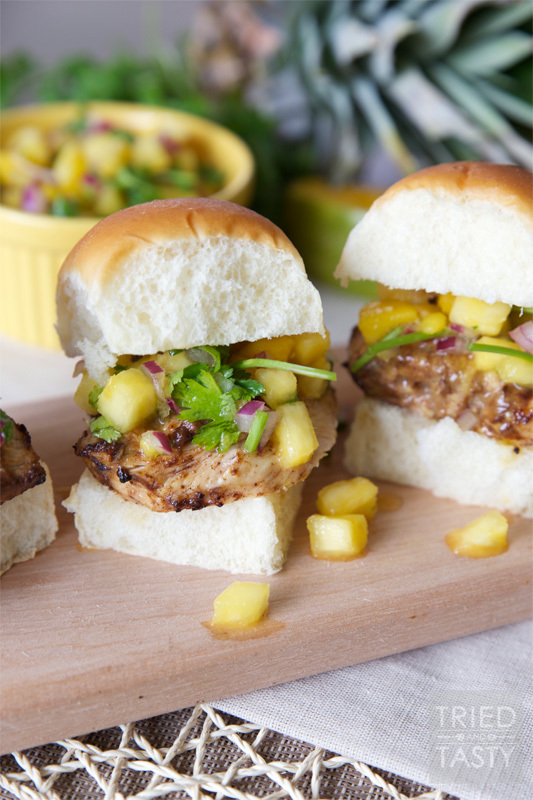 Split each roll and place one piece of chicken followed by about ¼ cup of pineapple mango salsa. Top with other half of roll. Cutest little sliders ever. Love the pineapple salsa. Yuuuum!! These look so good! I'm going to have to try this. Wow, Yvonne, these look amazing! Your pictures are gorgeous and I wanna take a bite into one of these sliders right now. Especially with that salsa! Oh how I love that cilantro hanging out! Thank you so much Aimee! Cilantro is the icing on top!!! These are so awesome, Yvonne! Seriously perfect for summer! Thanks Matt! They were so yummy and VERY perfect for summer! Yummy recipe!! Looks amazingly delicious!! Thanks so much for the recipe!! Jerk chicken is something I don't have nearly enough. These little sliders look fantastic. 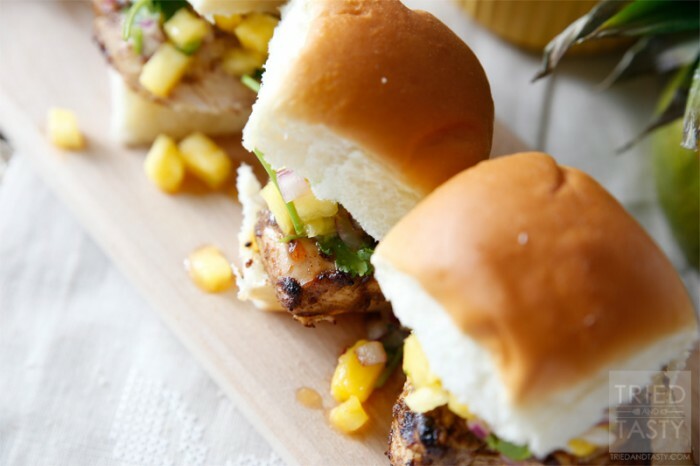 What fancy and fun sliders! I don't think to make sliders and I really need to. These look amazing and I'm making them this weekend. I just have a quick question. You say it serves four...is it two sliders per person for a total of eight? Because it looks like you cut the chicken breast in half twice?